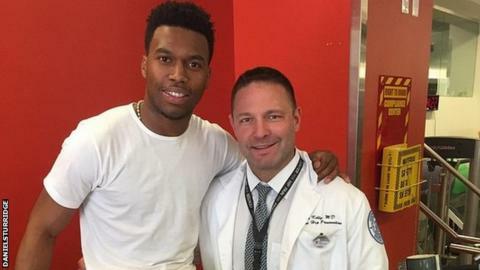 Sturridge on Instagram: "With the genius himself Dr. Bryan Kelly Thanks for doing a great job on my hip!!! Everything this man has explained to me gives me assurance that I'll be back to my best in no time!! Thank you." Liverpool manager Brendan Rodgers expects injured striker Daniel Sturridge to resume training in September. The 25-year-old England international underwent a "successful" hip operation in the USA last week. Sturridge has played just twice since he picked up the injury in the 2-1 loss to Manchester United on 22 March. "We are hopeful the issues he's had have been resolved," said Rodgers. The forward scored 24 goals from 33 appearances last season but has played only 18 matches for Liverpool this term. Rodgers added: "We're anticipating it's going to be around September before he can actually start training and then it's about getting his fitness up." After suffering a thigh strain in training for England on 5 September, Sturridge missed close to five months of football before scoring on his return in Liverpool's 2-0 win over West Ham in January. Read more on Robbie Savage: Who will challenge Chelsea next season?